Let&apos;s start with this interesting set of facts: Michigan is home to the seventh most sought-after bird in the continental U.S. -- the Kirtland&apos;s Warbler -- and is ranked seventh in the total number of reported birders. However, when it comes to the number of out-of-state birders our state attracts, we’re fourth from the bottom: 46th out of all 50 states. It doesn&apos;t make sense. So last year a small committee of Northwest Michigan birders launched the Sleeping Bear Birding Trail, the first in Michigan. 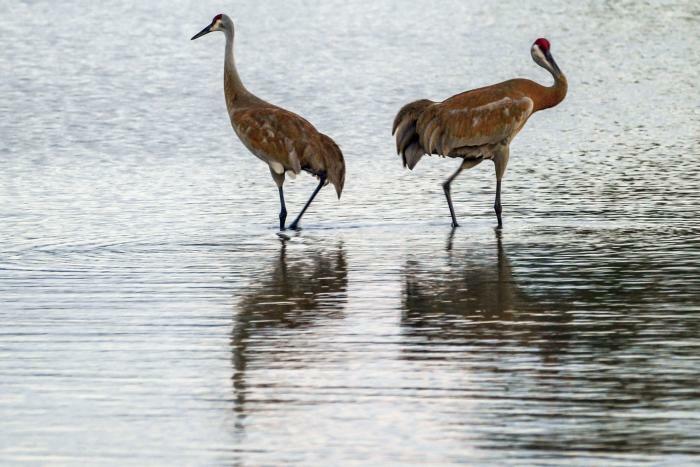 A birding trail is a travel route: a route that connects recommended, high-quality birding locations where walking trails already await avid birders, year-round. This one follows highway M-22: 123 miles of scenic roadway along the Lake Michigan shoreline from Traverse City to Manistee County. At its northern end, M-22 wraps around both sides of the Leelanau Peninsula, running along the open waters of Lake Michigan and West Grand Traverse Bay, ending at the intersection of M-22 and M-72. Just north of that intersection near Carter Road is Fulton Park, a park that is one of the trail’s least known sites but that offers fine birding possibilities very close to Downtown Traverse City. Its single trail passes over secluded, open water in the middle of the property and connects with the paved Leelanau Trail (providing easy bicycle access from town), then swings back around through hardwood wetland to the parking lot. Along its middle stretch M-22 runs through the Sleeping Bear Dunes National Lakeshore, whose famed beaches house of one of Michigan&apos;s most endangered birds, the Piping Plover. To the south are prime birding locations of the Benzie and Manistee counties, including the splendid Arcadia Marsh and Grasslands. This 300-acre prairie-grass complex is home to more than 20 ground nesting species, including Bobolinks. Both the marsh and grasslands are managed by the Grand Traverse Regional Land Conservancy, one of the Trail&apos;s major partners. The Sleeping Bear Birding Trail website is the most important tool for birders wishing to get out to any of the recommended locations. A customized BirdTrax widget is located right on the home page for a quick look at all recent sightings along the trail. Click on the Bird Search tab at the top of the home page to find complete descriptions of the 321 species of birds seen along the trail, and click on the Birding Sites tab to find descriptions of each of the recommended birding locations. Under that same tab you&apos;ll find a map and site descriptions for the Benzie Bonus loop -- an additional 13 birding locations located on a separate route leading into eastern Benzie County and back to M-22. For additional information on birding in Traverse City click here.